Stone, as well as being a coplanar and flat surface shaped into fine slabs, offers itself to a designer as a profound mass, susceptible to definition by design, which when carved and engraved reveals the attribute of form. 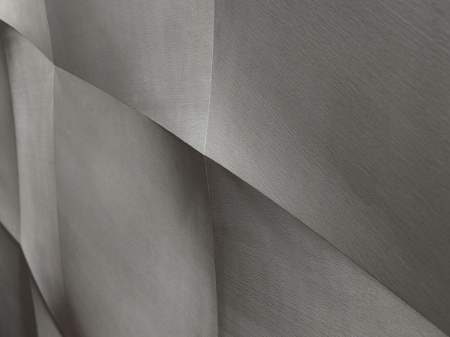 Also within the fine threshold of a slab, modern technology creates new frontiers in surface workability, imprinting a relief onto a plane and, while it removes light veils of material following a pre-set design, it marks out a third dimension, restoring the value, if not of depth, at least of three-dimensionality. This reflection is inspired by the design potential of stone surfaces and it follows a path from wall coverings, through continual metamorphoses, to formalised complex structural elements for architectural spaces. 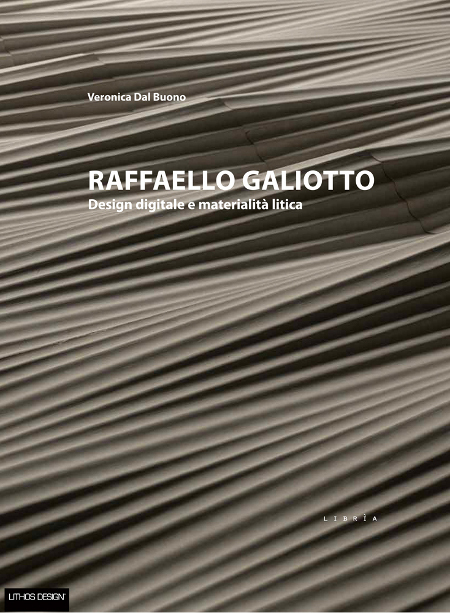 The work of Raffaello Galiotto, in partnership with the Vicenza company Lithos Design, follows this experimental path and contains some new revelations. Our essay is structured and aimed at describing its creative-imaginative and procedural-productive process, and is part of a broader reflexion on the theme of surfaces for design and architecture, developed specifically within the culture of stone design.1. Although wrapped in polysemantic layers of theoretical, cultural and intellectual values that belong to the collective image of historical memory, stone (as is also the case with other traditional materials)2, has undergone powerful transformations and modernisation over the last twenty years. Modern experimentation has updated the formal language of stone, declining its polysemous and multifaceted nature in heterogeneous hybridisations. As hard and rough as it is workable, stone undergoes transformation processes that cause it to appear in apparently completely contrasting forms: thin or thick, light or extremely heavy, dark and opaque or translucent, rough and uneven or smooth and honed. Contemporary designers can fully explore the continually varied and wide range of possible colours, textures and compositional rhythms, combined with the exceptional corporeal nature of the material itself. 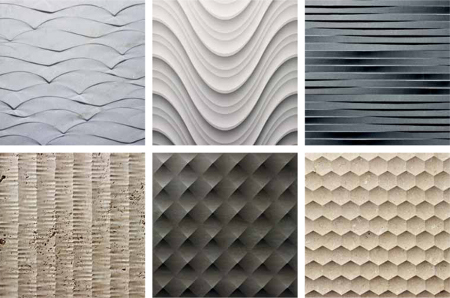 Observing the elements of Lithos Design’s ‘Le Pietre Incise’ collection, following the development of ‘Curve’ and ‘Curve Luce’, being seduced by the plastic and fluctuating stability of ‘Muri di Pietra’, to arrive at the solid three-dimensionality of ‘Materia Litica’ and that of the innovative coverings in various thicknesses of ‘Drappi di Pietra’, is to see the designer’s interest in both new virtuoso forms of fine stone coverings and symmetrical evolutions in thickness. The research carried out by Raffaello Galiotto, who is responsible for these collections, appears to us to be an experimental and innovative path that is in complete harmony with that of the company. The essential premise of this unique, complex and on-going project is the use of stone. The geometric variations, the regular and replicative modularity of design and the compositional possibility of the elements combine with the special features of the material – the colour, grain and veining that varies from block to block, from slab to slab. Stone’s natural lack of uniformity, which corresponds to different reactions to the tools used on it, becomes an added value that is constantly interpreted in the project. Galiotto’s design, which then becomes a formal, plastic reality on the surfaces of the slabs, ‘overwrites’ and absorbs the natural design of the stone, highlighting its representative dimensionality. The resulting composability of the stone elements harmonises and re-links the discontinuity of the material beneath. It creates continuity, even if it is not linear, and both defines the relationship between the surfaces and the space covered, which is the final aim of the project. Walls become pages in a tale full of signs that are reciprocally linked by the mathematical, iron logic of the lines, and mutate, vibrate and acquire volume and depth as a result of the various distribution of light on the plastic reliefs. This is the unmistakeable linguistic aspect of stone design: in the design there is no distinction between the epidermis, the surface colour – the perceptive limits of bodies – and the material beneath that is revealed. The form of the elements, which is reiterated in a series, is associated with the material’s aura of specific uniqueness; the singleness of stone, which gradually acquires a new nature as tools hew and model it, guiding automatic machines to a modern way of gently sculpting and shaping the material. Numerically-controlled programming directs and manages the work of the tools, precisely marks the surface and sets the depth, width, angle and distance of the incisions, as well as the quantity of material to remove; yet it is man’s creative vision that defines these parameters. The result of this combination are new stone artefacts: industrial products with original geometric shapes, which – although they embody the precision of automatic production – magically conceal the feasibility of such a complex representation; and this, even to the expert eye, appears as the elegant, new, prodigious work of a machine, the result of unexpected technical solutions, though with a sculptural flavour. 1 In the last twenty years awareness has spread that stone can be interpreted and transformed through new and contemporary languages to play again an active role in architecture and design. 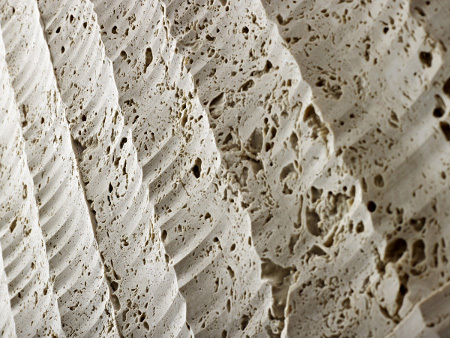 A fundamental contribution to developing this line of thinking is made by the cultural activities that take place every year as part of Marmomacc, the international exhibition of marble, design and technology, promoted by the Verona Trade Fair Organisation, (like the ‘International Award Architecture in Stone’, ‘Marmomacc Meets Design’ and ‘Best Communicator Award’). In the volume L’architettura di pietra. Antichi e nuovi magisteri costruttivi (Lucense Alinea, 2004, pp. 625) – Stone Architecure (Skira, 2006) for the international scene, Alfonso Acocella – has clearly affirmed the re-evaluation of design and construction skill in contemporary ‘Stone Style’. The book was the starting point for a large-scale and ambitious project. Since 2005 the themed blog architetturapietra2.sviluppo.lunet.it, has enlivened the debate and is the expansion into the Internet of the research project begun through the book and production model, with content that is open, trans-disciplinary and of collective intelligence. The culture of stone materials has been recently strengthened by the spread of specialist training courses at universities and professionals institutes. 2Traditional materials like glass, metal, ceramics, conglomerates and wood have for some time followed the path of innovation, inspired by the eclecticism of polymers, the ‘invented material’ par excellence of the 20th century, becoming flexible and versatile for the needs of designers. Today, nano-technology moves in a parallel direction to that of the macroscopic science of materials, and is able to design innovative, intelligent and high-performance artificial materials, sometimes contaminating traditional materials and hybridising their potential.